A supportive working environment, meaningful work and the ability to innovate creatively are some of the reasons Mr Jonathan Yee loves his job. 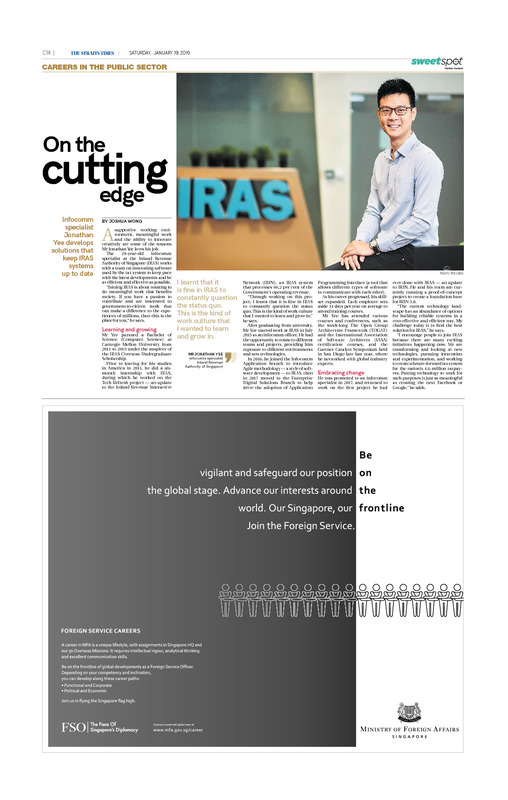 The 29-year-old infocomm specialist at the Inland Revenue Authority of Singapore (IRAS) works with a team on innovating software used by the tax system to keep pace with the latest developments and be as efficient and effective as possible. “Joining IRAS is about wanting to do meaningful work that benefits society. If you have a passion to contribute and are interested in government-to-citizen work that can make a difference to the experiences of millions, then this is the place for you,” he says. Mr Yee pursued a Bachelor of Science (Computer Science) at Carnegie Mellon University from 2011 to 2015 under the auspices of the IRAS Overseas Undergraduate Scholarship. Network (IRIN), an IRAS system that processes 66.2 per cent of the Government’s operating revenue. “Through working on this project, I learnt that it is fine in IRAS to constantly question the status quo. This is the kind of work culture that I wanted to learn and grow in,” he says. After graduating from university, Mr Yee started work at IRAS in July 2015 as an infocomm officer. He had the opportunity to rotate to different teams and projects, providing him exposure to different environments and new technologies. In 2016, he joined the Infocomm Application branch to introduce Agile methodology — a style of software development — to IRAS, then in 2017 moved to the Enterprise Digital Solutions Branch to help drive the adoption of Application Programming Interface (a tool that allows different types of software to communicate with each other). As his career progressed, his skillset expanded. Each employee sets aside 14 days per year on average to attend training courses. Mr Yee has attended various courses and conferences, such as the week-long The Open Group Architecture Framework (TOGAF) and the International Association of Software Architects (IASA) certification courses, and the Gartner Catalyst Symposium held in San Diego late last year, where he networked with global industry experts. He was promoted to an infocomm specialist in 2017, and returned to work on the first project he had ever done with IRAS — an update to IRIN. He and his team are currently running a proof-of-concept project to create a foundation base for IRIN 3.0. “The current technology landscape has an abundance of options for building reliable systems in a cost-effective and efficient way. My challenge today is to find the best solution for IRAS,” he says. “I encourage people to join IRAS because there are many exciting initiatives happening now. We are transforming and looking at new technologies, pursuing innovation and experimentation, and working to create a future-forward tax system for the nation’s 4.6 million taxpayers. Putting technology to work for such purposes is just as meaningful as creating the next Facebook or Google,” he adds.